How many people are eligible? What are the demographics of people who are eligible? Do you have defined groups about which you want to understand current eligibility (e.g., vulnerable populations)? How many people with specific demographic characteristics (example: seniors, 65+) are eligible for our services? What proportion of our service area’s poverty population includes seniors? What percentage of our area’s seniors are in poverty? These numbers can be compared to internal data regarding the percentage of our clients who are seniors. Should it match the portion of the poverty population who are seniors? Does a high proportion of seniors in poverty make that population a higher priority for our organization? 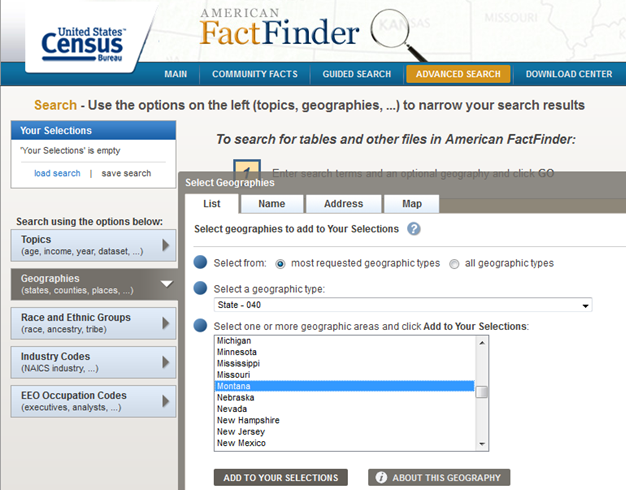 Select a geographic type from the drop down (in this example: geographic type is state, state is Montana). Click Add TO YOUR SELECTIONS and close the Select Geographies window. In the “topic or table name” box, enter B17024 or S1701 (depending on the data categories you need) and select GO. From the list of tables that appear, click on the latest available 5-year estimate. Download the table to Excel. If the numbers downloaded into Excel as text, highlight the relevant cells, right click, and select Convert to Number. Perform calculations (including adding up all the numbers of people under 200% poverty (because that is a good proxy for identifying all eligible people) from the various age groups in the B17024 data). Create a table like the one below in which the results of your calculations can be entered. Create pie charts or other graphics, if helpful.